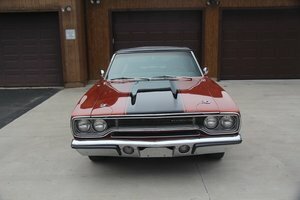 Road Runner Stood Officially As The Only Mid-Sized Muscle Car For Model Year 1972. Plymouth Paid $50,000 To Warner Bros.-Seven Arts To Use The Road Runner Name And Likeness From Their Wile E. Coyote and The Road Runner Cartoons. As Well, As A ""Beep, Beep"" Horn, Which Plymouth Paid $10,000 To Develop. Very Nicely Maintained Older Restoration On This Classic Mopar!